I was told that these are some sort of “potato tarts.” This screen only shows up for about 10 minutes: from 6:00 pm to 6:10 pm every day. The “morning coffee” screen is from 7:00 am to 9:00 am. The late night screen is from 9:00 pm to 7:00 am. After the other screen is active from 9:00 am to 9:00 pm except for the 10 minutes at 6:00 pm. I’m not crazy after all… at least on account of seeing tator-tots on the BibleWorks splash screen! I never even noticed the different screens at different times. I’ll have to try to catch that one. I’ve used version 7 since it came out and never noticed either! I’d seen the tater tots a few times when I first got Bibleworks. Then I told other pastor friends about it and they all thought I was crazy. 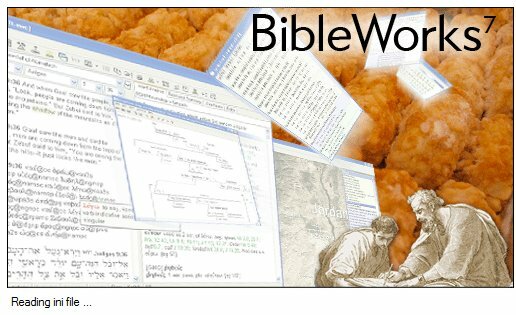 Every time I opened Bibleworks for about 8 months, I did so ready to do a screen capture, but no tater tots. Then, lo and behold, I finally caught it. It’s nice to discover that I’m not the only one who saw it. Very nice. Apparently we only have a 10 minute window in any given day to see it! I just saw it. Truly wierd.